I came across an interesting study the other day, courtesy of Dr. John Briffa's blog. It's titled "Margarine Intake and Subsequent Coronary Heart Disease in Men", by Dr. William P. Castelli's group. It followed participants of the Framingham Heart study for 20 years, and recorded heart attack incidence*. Keep in mind that 20 years is an unusually long follow-up period. Heart attack incidence increased with increasing margarine consumption (statistically significant) and decreased slightly with increasing butter consumption (not statistically significant). People who ate the least margarine had the highest prevalence of glucose intolerance (pre-diabetes), smoked the most cigarettes, drank the most alcohol, and ate the most saturated fat and butter. These were the people who cared the least about their health. Yet they had the fewest heart attacks. The investigators corrected for the factors listed above in their assessment of the contribution of margarine to disease risk, however, the fact remains that the group eating the least margarine was the least health conscious. This affects disease risk in many ways, measurable or not. I've written about that before, here and here. They didn't publish a breakdown of heart attack incidence with butter consumption over the two periods. The Framingham study fits in perfectly with most other observational studies showing that full-fat dairy intake is not associated with heart attack and stroke risk. It's worth mentioning that this study was conducted from the late 1960s until the late 1980s. Artificial trans fat labeling laws were still decades away in the U.S., and margarine contained more trans fat than it does today. Currently, margarine can contain up to 0.5 grams of trans fat per serving and still be labeled "0 g trans fat" in the U.S. 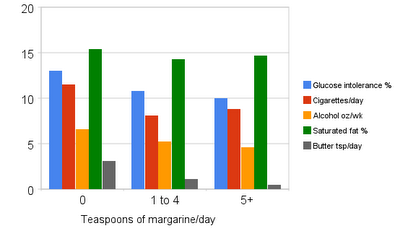 The high trans fat content of the older margarines probably had something to do with the result of this study. That does not make today's margarine healthy, however. Margarine remains an industrially processed pseudo-food. I'm just waiting for the next study showing that some ingredient in the new margarines (plant sterols? dihydro vitamin K1?) is the new trans fat. * More precisely, "coronary heart disease events", which includes infarction, sudden cardiac death, angina, and coronary insufficiency. My mother is exactly that person who eats the least margarine, the most butter and meat, and cares the least about her health (until her new health-conscious boyfriend came along). I think this may have spared her a heart attack despite her having smoked for 30 years. I used to get on her case about her diet, but now I'm glad she didn't listen to me! And instead of being horrified by all the butter she fed us, I'm now grateful. Though it didn't totally counterbalance all the sugar. Unfortunately, despite having low cholesterol and low blood pressure, she's now on Lipitor, along with every other person over 65 I've ever met. She had some angina last year and tests showed some atherosclerosis. My take is that this is due mainly to her being on warfarin since the 1980's due to a post-surgical blood clot that ended up in her lung. So now she gets to be on warfarin *and* Lipitor. *Sigh. * She still likes them saturated fats, though. Go Mom! Great information, as always, Stephan! butter or margarine aside, it looks like no matter what fats you eat or not, the probability that you'll have a cardiac incident in 20 years is about 1/3? or am I ignorant of something, especially what's behind the phrase "age adjusted"? This post is going in my "Permanent Collection for Schooling Vegans"! It is curious that this 3-bin stratification by margarine consumption (0,1-4, 5+) shows, to a high degree of statistical significance, no differences in average Saturated Fat consumption, at a level of 15%. In my view, visual inspection of the graphical data also suggests little differences in alcohol consumption, cigarette intake or glucose intolerance, tho' at a lower level of significance than for Sat Fat. I do not see that these data and analyses, provide any insight or guidelines into the idea that low margarine consumption is an indicator of health indifference, measured by Sat Fat, Cigarette intake, alcohol consumption and glucose intolerance. Ten scientific studies have directly evaluated the health benefits of soft margarine spreads versus butter, and all have confirmed that margarine spreads are the healthier choice. One groundbreaking study, published in the Journal of the American Medical Association, showed that making the simple switch from butter to soft margarine spreads lowered levels of LDL (bad) cholesterol by nine percent in children and eleven percent in adults (1). Not only do today’s soft spread margarines list “zero grams” of trans fat on the Nutrition Facts Panel, they are lower than ever before in calories, total fat and saturated fat. Made from natural vegetable oils, margarine is cholesterol free and provides a dietary source of vitamin E, polyunsaturated fats and essential fatty acids. The American Heart Association, the National Institutes of Health National Cholesterol Education Program and the FDA all recommend soft/tub margarine over butter as the best nutritional choice. (1) Denke et al. Individual Cholesterol Variation in Response to a Margarine- or Butter- Based Diet. Journal of the American Medical Association. December 6, 2000. Vol. 284. No. 21. 2740-2747. You know the right ideas are making headway when the drug and food industries and public health "experts" starts leaving comments on your blog/website. Run away from it as fast as you can! I work in the area of nutrition and one of the clients I work for is the National Association of Margarine Manufacturers. So not only am I interested in heart-health living personally, but professionally as well. I love staying abreast on the latest health news trends, and scientific research If you’re looking for news, tips, advice and commentary on “healthy-heart” eating and how margarine products fit in, then you’re at the right place! I encourage all those interested to help “spread the health” and use the healthy spread! Emma's on a Prudent Diet, based on a surrogate marker (LDL-c level). Good luck with that. Hopefully, she'll read Dr William Davis' Heart Scan Blog and learn what really causes heart attacks. Emma, LDL-c level is only one factor and a reduction of 11% is nothing to write home about. Don't ignore LDL-c particle size, HDL-c, TG, Lp(a), w-6:w-3 ratio, HbA1c, Vit D3, Vit K2 etc. 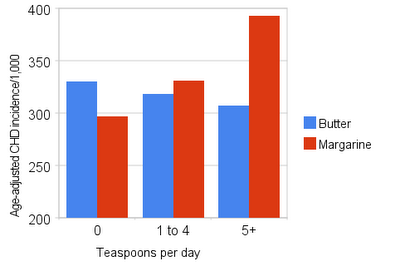 What's the w-6:w-3 ratio in your margarine? emma's blog is called "I Heart Margarine"
Stephan, I don't understand the first graph. Are we looking at three groups, or six...or what? Is the third graph about just the second ten years? Emma: "the simple switch from butter to soft margarine spreads lowered levels of LDL (bad) cholesterol by nine percent in children and eleven percent in adults"
Stephan already observed in an earlier post that the linoleic acid (in margerine) does lower cholesterol, but that this doesn't actually confer any benefits and that butter doesn't raise cholesterol (except relative to LA's artificial lowering of it). "today’s soft spread margarines list “zero grams” of trans fat"
...And he observes in this very post that they can nevertheless contain up to 0.5g per serving despite the listing. "lower than ever before in calories, total fat and saturated fat." Not that being lower in calories would help at all if the 'food' is less subjectively satisfying than SFA and not that avoiding saturated fat would be desirable (given that the rest of the series implies that it doesn't raise cholesterol in any relevant sense). "Made from natural vegetable oils,"
... by a wholly unnatural process! Not that volume of cholesterol consumed is in any way significant compared to the amount the body makes. "provides a dietary source of vitamin E, polyunsaturated fats and essential fatty acids." Isn't much of the vitamin E in these products often the synthetic kind that tends to kill people whenever they're given supplements of it? And wouldn't that be the omega-6 polyunsaturates that increased inflammation and oxidation (and by extension oxidised cholesterol)? Re: Emma's post touting margarine as a healthier choice. One thing I've learned is that looking at intermediary effects of food - for instance, lowering LDL cholesterol - is *not* a good indicator that something is good for you or prevents heart disease. And if the intermediary effect you're tracking turns out *not* to be associated with better health - and "lower LDL" may not be, after all (probably isn't!) - you are only proving that your food/substance produces an effect that is irrelevant or worse. "Lowering LDL" is a good example. Our understanding of LDL is becoming more complex with small, dense LDL particles being seen as harmful and large LDL particles now considered neutral or good, depending on who you ask. Those numbers are quite high, aren't they? I don't have the paper in front of me so I don't know exactly how they age-adjusted. I agree that the differences in saturated fat consumption between groups was small. As for the other differences like glucose intolerance and smoking, I have to disagree; those differences are meaningful. In any case, there is clearly a strong inverse relationship between margarine and butter intake, and this corresponds to a highly significant association with heart attack risk. I think my readers pretty much handled this one for me already (thanks guys). I'll just point out that 10 studies showing LDL lowering aren't worth a single study showing an actual increase in heart attacks. Actually, there are several studies suggesting that hydrogenated margarines increase heart attack risk, despite lowered LDL. And please, lay off the misleading "0g trans fat" BS. You know very well what that actually means: "0.5g or less per serving, rounded down." It's the same group of people, analyzed in two different ways. One color represents people divided based on margarine intake, while the other is people divided based on butter intake. I put them on the same graph for simplicity. PUFA's probably decrease LDL. On the other hand, Stephan has discussed trials showing that a PUFA-rich diet increases oxLDL by about 30%. In another study, participants with high oxLDL had a 4.25 higher risk of heart attack than patients with lower oxLDL. GRAS (a method which includes age, total cholesterol, HDL, blood pressure, diabetes and smoking status) was able to correctly differentiate a healthy person from a person with coronary artery disease 49% of the time, while oxLDL was correct 82% of the time. oxLDL blew away all other blood lipid markers by nearly a factor of two. You do not want to decrease your LDL by 11%, when at the same time you are increasing your oxLDL a lot, as this would also increase your heart attack risk. Do not ignore half of the evidence. Great post! Loved Castelli and his diet!! The man is KING. Your knowledge base is a million times more than ALL trained cardiologists and even lipidologists! Kudos to you GRRRRRLL! When the LDL goes 'up' with saturated fats or omega-3 fish oils... it's all the good stuff. When the LDL goes 'down' with polyunsats (whether they are hydrogenated or not)... it's ALL the BAD oxLDL stuff. DENSE -- just like the morons that try to promote them. yep margarine is bad for your health, stay away from it. How about Castelli's mantra that people with TTL Chol under 150 don't get heart attacks? Is that reason enough to eat the kind of diet that might get TTL Chol down that low? I'm sure if I told my doctor that my TTL Chol is 234, he'd prescribe a statin drug in a heartbeat. But, I figure that with my trigs at 59 and my HDL at 63, my LDL is overestimated and probably the big fluffy kind. Thanks! I got it from WAPF, this blog, and Heart Scan Blog, which I found here. This online community rocks. I just wish I could get my mother-in-law to read this stuff... along with a million or so other people. There's no doubt that the heart attack rate is much lower at 150 than it is at 250, in American populations. But in Japan it doesn't seem to matter whether you're at 150 or 250 mg/dL TC, and in fact your overall risk of dying is lower at 250. So it's not a universal phenomenon. Oh also, the idea that lowering TC by eating PUFA oils might lower heart attack risk has already been directly tested in controlled diet trials... it doesn't work. Daily intake of fruit and vegetables was associated with a lower risk of coronary heart disease when combined with a high dairy fat consumption (odds ratio 0.39, 95% CI 0.21-0.73), but not when combined with a low dairy fat consumption (odds ratio 1.70, 95% CI 0.97-2.98). i have a question. I am on a high-protein, low-carb, low-fat diet. But i would like to know if whole-eggs are fattening? Because right now i only eat egg-whites. I even have an egg-divider that i bought at the website of Sears http://www.sears.com For dividing the egg-whites from the yolks. I've been eating this way because i've read that when people are following a low-carb diet they have also to take into consideration the amount of calories. And since fats have the double amount of calories, i thought that it is rational to eat low in fat. So my basic question again is, if whole-eggs are allowed in low carb diets of 30 grams to 70 grams of carbohydrates a day. Well marxist-socialist, you shouldn't be on a low-fat diet in the first place. Certainly eat the yolk too, it contains almost half of the protein in the egg, a lot of choline, a shitload vitamins and a bunch of minerals, why would you want to waste that? Yes eggs are highly recommended in a low-carb diet (unless you have an egg allergy that is). Btw, i made ghee yesterday, some indian friend recommended it to me, and it really tastes a lot better than butter. Certainly worth trying out. Useful 30 minute radio program Food Program Radio 4 Listen Again Michael Crawford Tony Hulbert Alex Richardson Jack Winkler and a spokesperson for Unilever. It'd probably be helpful if you stop thinking in terms of a diet that's high protein, low fat and low carb. There are certain biological limits on how much of your daily calorie needs can be met by protein; let's say around 35% practically. So even if you eat only protein for 35% of your protein needs, you're really getting 65% of your daily calories from (your own body's) fat (or causing your metabolism to drop). Yolk is certainly fine while low carbing: you could have 10 whole eggs and for les than 4g of carb (and 700 calories). Incidentally that would be around 35% calories from protein and the rest from fat, so arguably ideal if you want to go as high protein as you can. Egg white alone is virtually pure protein, few nutrients. Arguably eating only protein and no other calories would be great for weight loss, but it would be wildly unhealthy. Ideally you'd eat enough protein AND get enough nutrients, either by eating nutritious protein sources (meats, liver, kidneys) or eating fats containing nutrients in addition to your bare protein. The low carbing is a good idea, but how much fat you want to consume depends on what your calorie needs/body fat stores are. Trying to eat "low fat" because it contains lots of calories per gram is pointless. If it's calories you want to avoid then it doesn't matter how many calories each gram of food contains: a tonne of feathers weighs as much as a tonne of concrete, after all. 10 calories of fat will fill you up far more than 10 cal of carb however, and won't mess up your insulin. Hello all: Thanks a lot for your accurate answer. What i will do is that i will make egg omelets made with 4 to 5 egg whites and 3 yolks. And i have been eating yolks lately and i feel a lot more full as compared to when i made egg-omelets of pure egg-whites. Protein, amino acids, vagus nerve signaling, and the brain tells us Protein and amino acids are more potent than carbohydrate and fat in inducing short-term satiety. The amount of protein or amino acids in a meal or diet regulates the signals to the brain. Increasing dietary protein usually reduces energy intake. Remember also the mechanism by which the signals to and from the brain are turned into actions is regulated by the Vitamin D status of the brain. There are some 180 different signalling proteins in the brain that respond to D3. This is OT, but have you seen this study ? Travison, TG, AB Araujo, AB O’Donnell, V Kupelian, JB McKinlay. 2007. A population-level decline in serum testosterone levels in American men. Journal of Clinical Endocrinology and Metabolism 92:196–202. As the Unilever dietitian had to concede in the BBC Food programme above, there is still about as much Trans fat in Flora Omega 3 Plus as the much advertised omega 3. There is this report online suggesting raising vitamin d intake also raised testosterone. over the last 20yrs there has been a gradual lowering of average vitamin d status. One caveat with butter is high exogenous ALEs. I don't obsess them. But butter is exceptionally high. Can't be a good thing. I love butter but it's hard to not consider it a lesser fat source. Have you seen Dietary ALEs are a risk to human health - NOT! which I found via AGE Content of Foods? just in case readers don't click the link nigel gave, the last sentence of the abstract reads "Overall, except in persons with compromised organ function, e. g., vascular, hepatic, or renal diseases, there is little evidence that food ALEs will have any significant pathological effects." I hadn't seen it, thanks. It's frightening to say the least! I'll have to read that book someday. I have what might be a dumb question. Am I a fool for thinking that the expensive, fancy butter alternatives are somehow not equivalent to the bad, trans-fat margarine I grew up with? "I'm actually kind of hoping you'll say, "Yes, you are a fool; it's marketing" so that I can throw out my fake butter and go all real butter, all the time." The fact is, no one knows. No one has ever done a controlled trial with any real measure of health as an endpoint using that margarine, and no one ever will. It's anyone's guess whether it will be fine or kill you in 20 years. Butter has a proven track record. What does the 77 and 82 means? Sir, can you help me to find related literature or study about alternative source for making butter? What do i mean is that I want to find out those study about new alternative source for peanut butter. Sir please help me. I'am doing my investigatory project as our requirment in High School and my title is jackfruit as alternative source of butter but i haven't related literature to support my study. I hope that you will help me. you can email at richellesantos92@yahoo.com. thanks and more power. I don't have access to the paper, but reading your post and the abstract make it sound like the researches didn't adjust for cholesterol levels or pre-existing heart conditions. That is to say, could it be possible the people with bad hearts decided to eat margarine? Yes, it's possible that people with CHD gravitated toward margarine and that contributed to the effect. However, there are two things that would argue against that as the sole explanation. 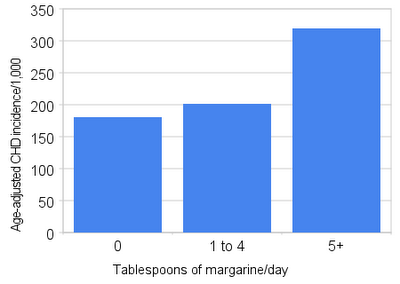 1) the negative association with margarine only became apparent in the second half of the study. If it were due to selection bias, you'd expect it to be just as strong of an effect in the first half. 2) trans fats have been consistently associated with CHD, regardless of the source. Still, it was an observational study, so we can't come to any definitive conclusions. I'm mostly just trying to point out that the advice to substitute margarine for butter is totally groundless. My biggest rebellious act when I left home for college was switching to butter, so I was very pleased when the evidence started coming out against margarine. I had a thought regarding the apparent decrease in CHD with increasing butter consumption. If you are eating that much butter, then it doesn't have much time to sit around and get rancid. My observation is that people ignore their nose and eat their rancid 3 month old butter. Perhaps more butter isn't better or worse, it is really just that the "more butter" is often the same as "fresher butter."